This year started with a Celebration of Life, aka a funeral, for ManO’s 97 year old uncle who chopped wood and lived on his own into his 90s. A life well-lived. This year will end with my daughter’s celebration of marriage to a guy who not only has made her happy beyond measure but us as well. As a society, we also celebrate lives, weddings, birthdays, promotions, weight loss, loss of a first tooth, straight As or just passing, new houses, sports wins, political wins, milestone anniversaries, remission from cancer or MS. The list goes on! And on! And on! [pullquote width=”300″ float=”left”]Through the season of Lent, I’m focusing more on the “Little Easters,” the Sundays not counted in the season as penitential but as celebratory days. I’m trying my best to focus on celebrating the right things the right way. [/pullquote]I figured the Bible would be full of references to celebration. Nope. The translated word only comes up a few times. Huh, celebrations weren’t focused upon? I don’t count Herod’s celebration where he orders John the Baptist’s head delivered on a platter. There’s part of the trouble with celebrations. First, we celebrate things the wrong way far too often. People get ugly when their candidate wins, uglier if their sports team wins, with “in your face” celebrations. A disliked co-worker’s downfall is applauded and becomes a catalyst for office gossip. Someone “gets what they deserve” and we dance. Second, there’s the tension of planning a celebration. Why was someone left off the wedding invite list? Who gets what in the will? The baby baptized this Sunday, did you hear the name? Just think about birthday parties with black Over The Hill signs. It can be ugly out there in party land. 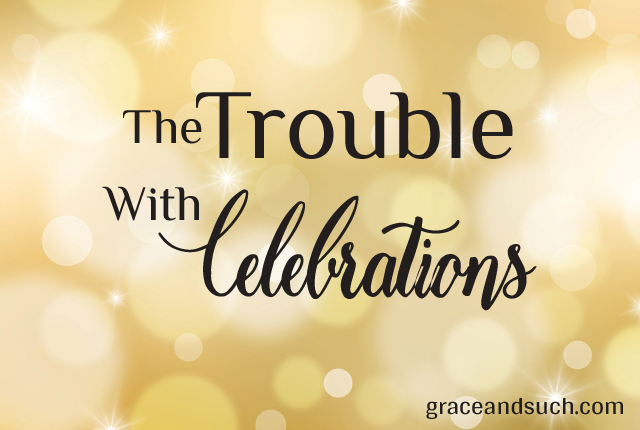 What have we let celebrations become? Maybe there’s a reason the Bible isn’t full of them. But there’s another story of celebration in the New Testament. A prodigal’s father calls for one when his wayward son returns home. Who is the father addressing? The older brother who stayed at home faithfully while his younger sibling partied. Why did they have to celebrate a party animal with another party? See, even back then, family tensions invaded the most special of celebrations. Maybe that’s part of why the parable is so loved. We can identify with all the players. Sure, we know the larger meaning of this parable Jesus told to illustrate God’s rejoicing at a lost soul returning to God but things get real. This is no abstract story. Ouch. Through the season of Lent, I’m focusing more on the “Little Easters,” the Sundays not counted in the season as penitential but as celebratory days. I’m trying my best to focus on celebrating the right things the right way. God working in my life to give me focus. The times I reconcile with a friend or a prayer is answered. When my community does something for the greater good. “See, even back then, family tensions invaded the most special of celebrations.” Isn’t that the truth? How often has the haze of discontent clouded the spirit of a celebration? Good reminder, Sis, of what to focus on when we celebrate. Thanks! I found out my sister wouldn’t allow black balloons at her last birthday. And the lesson held up for her retirement party. As she said, no negativity, just joy. Thanks for commenting. With the focus in Lent on confession and repentance, I like the idea of celebrating the little Easters, the Sundays during Lent…although I guess there is no reason to celebrate every Sunday throughout the year in much the same way. There would always be a sense of anticipation, like when’s the party beginning! Like your idea a lot! Yes, exactly. That is what Sabbath and worship should be about! Thanks for your thoughts. Never looked at the Scriptures this way, thank you. Brings to mind a friend of mine. Her sweet daughter went to heaven nearly 5 years ago at age 8, after 4 years of illness due to an anoxic brain injury. They grieved her (and still grieve, I’m sure) twice, once for losing the healthy child they had, and the second time when they said good-bye for now to the sick child.It was very important to my friend that there would be a nice place for her family to come and remember this child (she was the last of 7 children). I’m one of those people who, before this happened, thought: do a quick cremation and be done with things, because it would be too painful to return to a memorial site. But, she mentioned to me that there are so many places in the Bible where God tells his people to remember Him and remember what He has done. He told them to build memorials. There is much more to this story that I could share, but all this to say…perhaps we aren’t to celebrate as much as we are to remember. Not sure if this relates to your intentions for this post, but this immediately came to mind, so I wanted to share. That’s a wonderful insight, Gretchen. I’ll remember that for sure. What a compelling reminder to celebrate the small things. Thanks, Julie. Thanks Nikki. I think it goes along with gratitude and not taking things for granted. A great post, Julie with some great insight to the prodigal son story. Thanks for sharing that. I’m going to start working on celebrating the right things the right things as well. Thanks for making me think! I am guilty of wanting things to be “just right” when planning any kind of celebration and often the stress overshadows the event. My (loving and candid) husband reminds me that it’s about the people, not about stuff being done just right to celebrate the people. God just wants us to love on each other. Thanks so much for your thoughts here. They’re making me think a lot. A LOT a lot. My family is slightly obsessed with celebrations.